Posts tagged "what blogging means to me"
I started blogging in 2008. My first post was on a Blog called The Glass Half Full, and my first post was on September 27, 2008. That was 6 years ago! When I look back at those first posts, they are interesting. Actually, they aren’t. They are pretty boring. I was just writing to write, and I didn’t know anything about monetizing, or an audience, or “how” to write. I just wrote. I think I enjoyed it. I never really got too personal, and I didn’t many many years ago. Most of my blogs were very short, only a couple of paragraphs, and they were quite sporadic. I didn’t write very often at all. Then I met a woman at the church I belonged to and she wanted to write together, so we collaborated. She had been blogging for awhile also, and had read books on blogging and websites on blogging, and despite whatever happened that was not positive I will say that she definitely taught me a lot about the mechanics of blogging. It was her idea to apply to BlogHer. She maintained the blogsite with backgrounds, and themes. We both paid for the domain name and any the expense. We had weekly “meetings” to plan and collaborate and share ideas. We actually worked very well together when it came to business. In the end it was a personal issue that drive us apart, and to be honest it was me who left her. I needed to walk away and that is a story that I will never tell because it involves confidential conversations I had and situations I was in while I was an employee at a church. However, she did teach me a lot so when I went back out on my own and created this bog I had much more knowledge about what to do. So for what it is worth, thank you for that Susan. When I started this blog, I did populate it at the beginning with blog posts I had written at the other site because I was emotionally drained. I had no will to write, and just needed some time to heal. But that has changed over the last two years I have been blogging on my own. My first blog post here On Coffee, Clutter and Chaos was on October 17, 2012. Since then I have blogged 151 times. I wrote 48 times in 2012 between Oct 17 and Dec 31. I wrote 63 times in 2013. Of those a couple were featured, a couple were syndicated and I was enjoying writing. Then something happened. I didn’t write between 3 December 2013 and 31 Jan 2014. When I did write again I was really wondering if I should continue or not. My mother had sharply criticized my writing saying what I wrote was “too personal” and “why did I have to write so much” about LGBT stuff? She thought I was being dishonest because I never talked about the father of my kids and how he and I were married for a long time, that I only seemed to focus on my life now with Karol. I must say that really deflated me. But when I out that post on Facebook I received a lot of positive comments, so I decided to continue. However, apparently I was not feeling completely convinced, because I only wrote three more times between 31 Jan and 1 June. Then something happened. I was leaving work and driving home and just happened to put on my local National Public Radio station, WHRO, and a man was talking about a book he had written. He was a comic and just happened to be blogging. He really wanted to write a book, but also wanted to be paid, so he decided to just write every day for 100 days to see what happened. During the 100 days of blogging, someone read his work and offered to publish a book if he wrote it. Now I have to apologize, even after researching it, I cannot find the name of the author or the book. But I decided that I would try it. I would write for 100 days and see if it took me anywhere or I had any monetary success, or if I even still wanted to write after I was finished. Well, life happens, and I was not able to write every day, but I did find out something interesting. I found out what blogging means to me. I found that I began to really enjoy writing. I had ideas all the time. I even out a recorder on the “front page” of my phone so I could just hit a button and record ideas when they came to me. For some reason I think about a lot of topics while I am driving….. I put a white board on the wall next to my desk so I could write down ides I got while I was balancing my checkbook or doodling around on Facebook. But more important I found that I started NEEDING to write. That it became soothing and cathartic. That if I was not able to write I became cranky and felt compelled to get to my computer so I could write. This week was no exception. My bff the Newyorican needed my help this week, and since she is my sister of course I went to her aid. But in doing so I missed my “writing time” which is in the morning as I sip my coffee. This seems to be the best time for me to write because my mind is fresh, and the boys are sleeping or at school, and the house is quiet. It is before classes, or homework, or other distractions. I put on Pandora, and I write. I noticed I was cranky because I missed writing. Hmmm, I didn’t expect that. 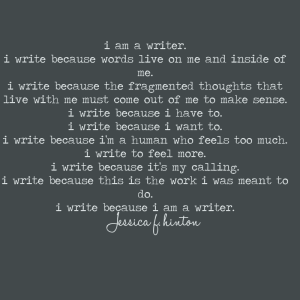 So what I have found is that to me blogging and writing have become a release. a way to get things out that are swirling around in my head. To ask questions and put things out there that are personal, and sensitive, and possibly divisive. That may upset people, or cause some folks to get mad at me. Or possibly cause someone to think, or learn something new. I have written about my concerns about racial issues, about lesbian bed death, about my kids, and about my partner. 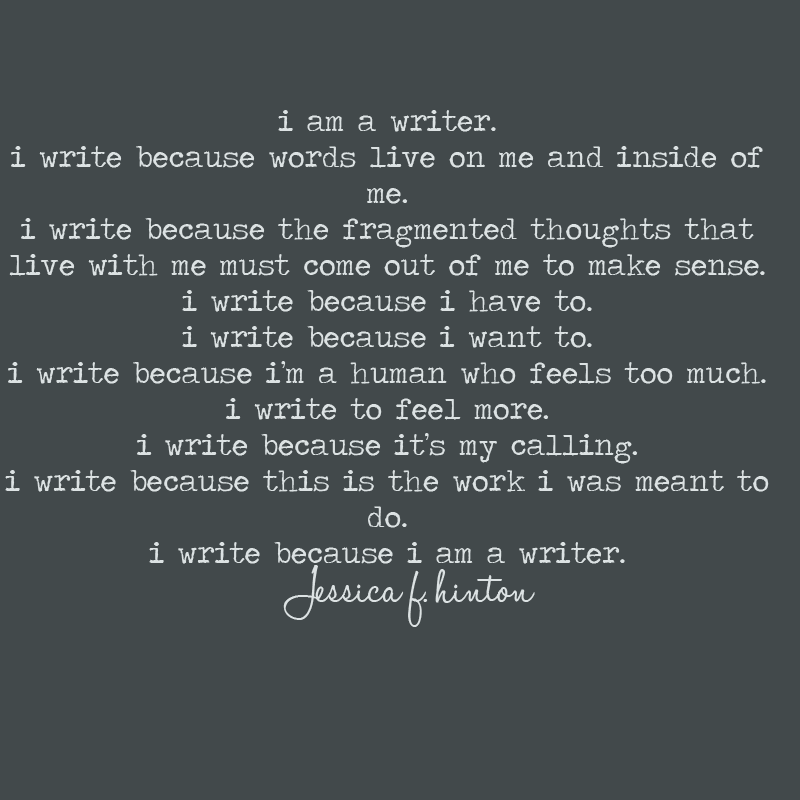 I love to write and have found something that feeds me emotionally mentally and spiritually. Jessica Hinton really says what I feel in my heart. Thank you Jessica for these words!